They have the ability to simultaneously compare multiple experimental treatments with the standard treatment in order to achieve more reliable results in less time as compared with separate Phase II trials to assess each novel treatment individually. An intermediate outcome measure is used to identify both treatments for which there is an early sign of effectiveness and treatments that appear ineffective thus allowing the study to continue with the promising experimental arms and to stop the investigation of insufficient treatments. Generally, MAMS designs, according to Parmar et al. (2008), are useful when (i) there are multiple promising treatments in phase II/III studies; (ii) there is no strong belief that a treatment will be more beneficial compared to another therapy; (iii) availability of adequate funds; (iv) there is an adequate number of patients to be enrolled and (v) there is an intermediate outcome measure correlated with the primary outcome measure. Parmar et al. (2008) encouraged the use of the MAMS strategy in the field of oncology but highlighted that these designs should only be used when quick outcome assessment is possible. At the interim stage, in the case where the observed effect size in an experimental arm is greater than a predefined critical value, accrual of patients continues within that arm to the second stage of the trial until the pre-specified number of events on the primary outcome (e.g. overall survival) measure is reached, otherwise the accrual of additional patients stops within that arm and the corresponding novel treatment does not enter the second stage of the trial. The aforementioned predefined critical value is calculated for each stage of the study in a way that takes into account whether the null hypothesis can be rejected at the level of the probability of the continuation of the study to the next stage should the null hypothesis be true as Parmar et al. (2008) state. The stopping thresholds are based on test statistics, resulting in dropping experimental arms which do not show effectiveness. The allocation to each remaining arm is fixed in MAMS trials, however, it is possible to assign more patients in the control treatment group than to the experimental arms which can yield small gains in efficiency over balanced randomization as Wason and Trippa (2014) highlighted; this strategy has been used in practice with the STAMPEDE trial where the control arm is compared with five experimental treatments with the corresponding randomization ratio 2:1:1:1:1:1. MAMS approach could be designed with either a fixed sample size by fixing the number of patients enrolled at each stage or a fixed number of patients enrolled per arm per stage. Note 1: The methodology has mainly focused on situations where the primary endpoint is assumed normally distributed or time-to-event. Two papers discuss MAMS designs with the normally distributed endpoint, whilst a time-to-event endpoint is used by Royston et al. (2003). Freely-available software in Stata for calculating sample size was proposed by Barthel et al. (2009) for MAMS trials. Note 2: A recent article by Wason et al. (2015) proposed a new Bayesian adaptive design for clinical trials with biomarkers and linked treatments in multi-arm phase II trials. It is a novel approach combining the methodology used for BATTLE, I-SPY 2 and FOCUS 4 trial, which results in significant power to identify treatment effects. This novel trial design could be used for simultaneously testing several predictive biomarkers and new experimental treatments in a more cost-effective and rapid way. Promising treatments are tested concurrently using a smaller number of patients as some treatments arms can be dropped early for futility. Reduced costs and time as they assess multiple treatments simultaneously. Preferable to continue with the investigation of promising treatments as compared to the conduct of separate single-arm phase II clinical trials. The simultaneous assessment of multiple experimental treatments increases the chance of identifying a promising treatment. It is unlikely that the trial will stop for futility as multiple experimental treatments are tested and hence, it is not likely that all experimental arms will be ineffective and dropped. Can ease the regulatory and administrative burden as compared to building—up separate trials. Unpromising experimental arms can be dropped in a quick and reliable way. High setting-up time due to the complexity caused by logistic issues and collection of experimental drugs from different companies. Operational challenges regarding the randomization and the modifications of allocation ratios after the performance of an interim analysis. Chow S-C, Chang M. Adaptive Design Methods in Clinical Trials, Second Edition Boca Raton, FL: Chapman & Hall/CRC Press Biostatistics Series; 2011. Description: It uses the MAMS approach combining two separate studies into one single study and uses interim monitoring as well as multi-arm design features. It connects the explanatory Phase II stage for treatment selection and confirmatory Phase III stage for the final comparison of the chosen experimental treatments with the standard of care. The Two-stage Adaptive Seamless design aims to improve the power in the Phase II stage in order to continue on the Phase III stage having obtained important promising information. In the definitive analysis, it uses data from patients registered during the Phase II and Phase III stages. A prerequisite of this strategy is the availability of a reliable early endpoint. Methodology Brannath et al. (2009) propose an approach which uses Bayesian decision tools and is based on the two-stage seamless design in order to confirm that the identified biomarker-defined subgroup from a Phase II study is sensitive to the new treatment in a separate explanatory phase (i.e., a study which is conducted at the same time with the two-stage adaptive seamless design) and afterward conduct a Phase III study with this selected subgroup. More precisely, the general procedure of this Phase II/III strategy is presented by Brannath et al. (2009) as follows: When half of individuals are recruited in the study, an interim analysis is performed in order to decide whether to accept or not a biomarker-defined subpopulation identified in a separate exploratory study. At this interim stage, a decision is also made about whether to continue accruing patients from the aforementioned biomarker-defined subset or from the entire study population. If the first case occurs, the treatment effect is assessed only in this biomarker subpopulation and if the second case happens, the treatment effect is tested in the entire population and biomarker-defined subgroup at the same time. In case that there is no identified biomarker-defined subpopulation from the separate exploratory study, the trial continues in the overall population using a classical group sequential design. The major advantage of this type of design is its ability to reduce the costs and also the selection of the target population in a reliable way. Also, appropriate methodology, such as that used by Brannath et al. (2009) where multiple testing is adjusted by a weighted combination of p-value from data of the second stage and the first stage, and Simes’ step-up process is used when combining data form both Phases in order to maintain the Type I error rate. An extension of the above approach by Brannath et al. (2009) is proposed by Jenkins et al. (2011) which can result in the rapid approval of novel treatments to the most appropriate individuals who are likely to benefit from the new drug. During the Phase II trial an interim analysis is conducted using a short-term intermediate outcome measure (i.e., survival endpoint) in order to select the population (either the entire population or the biomarker-positive patients) which will be used in the Phase III study with a long–term endpoint. Mehta et al. (2014) proposed an alternative seamless approach for subgroup selection in time-to-event-data for situations where there is no a priory assumption that a biomarker is predictive of treatment efficacy; consequently their design tests whether there is treatment effect in both biomarker-negative and biomarker-positive subpopulation separately instead of testing the null hypothesis of no treatment effect in the entire study population and in biomarker-positive subset. According to Scher et al. (2011), formulas for sample size calculation/allocation are proposed in situations where the study endpoints are continuous, discrete, and contain time-to-event data supposing the availability of a well-established relationship between the study endpoints at different stages, and that the study objectives at different stages are the same. Ang et al. (2010) have stated that even in case that the trial stops early, a Phase III infrastructure should be developed. Such strategies have been proposed by Ellenberg and Eisenberger (1985) and Inoue et al. (2002) for evaluating the possibility to stop early or to continue to the confirmatory phase III repeatedly during the explanatory phase. The aforementioned designs are useful in situations where there is strong belief in the efficacy of the experimental therapy that can lead the study to the confirmatory phase, but confirm of this assumption is needed. Despite the fact that this approach is considered as a more efficient strategy yielding larger power as compared with the conduct of separate trials, it can lead to introduction of bias and inflation of the type I error rate. The evaluation of each experimental therapy can be performed without requiring the conduct of separate large-scale Phase II trials. A significant concern is that the results obtained from the Phase II analysis, which becomes an interim analysis of the Phase III study should remain in the hands of the data monitoring committee due to confidentiality. Flexibility and efficiency of trials can be increased. Concerns also arise regarding the efficiency and validity of such a trial design. Individuals from both explanatory and confirmatory stages are used in the definitive analysis; hence, the design avoids ‘wasting’ individuals already registered in Phase II setting. Sometimes, the endpoints within the different phases are dissimilar, hence, a decision is required on how to combine the data obtained from both stages in order to use them in the definitive analysis. This challenge is further discussed in the paper of Chow et al. (2007). Diminishes the potential loss of time between the completion of Phase II stage and the beginning of patient enrollment in Phase III setting. According to the Draft Guidance by U.S. Food and Drug Administration (2010), an adaptive seamless phase II/III design is described as a less well-understood design which may introduce bias and inflation of the Type I error rate. The same standard of care can be used in both stages of the study. Calculation and allocation of the necessary sample size for the two separate studies. Can result in the same quality of evidence as in a traditional design but with a smaller number of patients. Can result in the speedup of drug development and also in a successful Phase III trial. More efficient due to the improved power and the ability to control the Type I error as compared with the conduct of separate studies. The required power of both individual studies may be acquired by using a smaller number of patients than that of a single study. Two separate trials (Phase II and Phase III) are conducted under one single trial protocol, but in reality, researchers analyze them separately using data from each stage, resulting in this way in savings of time and cost. U.S.Food and Drug Administration. Draft Guidance for Industry—Adaptive Design Clinical Trials for Drugs and Biologics. : U.S. Food Drug Admin, Rockville, MD; 2010 [cited 2015 10 Oct]. Available from: http://www.fda.gov/downloads/Drugs/…/Guidances/ucm201790.pdf. Description: This strategy aims to find the most beneficial treatment for future patients based on their biomarker profiles, with a guaranteed probability of correct selection. It was proposed for the examination of multiple composite hypotheses not only in the entire study population but also in the biomarker-positive subgroups. The design is based on approved treatments, and aims to improve patient’s health by providing them with the most efficacious (yet unidentified) treatment. Additionally, another crucial objective of this approach is that the development of a novel treatment strategy for the forthcoming patients and the confirmation that the treatment effect of this strategy is in fact more effective than the historical mean effect of the control treatment plus a predetermined threshold. According to Lai et al. (2013), it is an approach for “jointly developing and testing treatment recommendations for biomarker classes, while using multi-armed bandit ideas to provide sequentially optimizing treatments to patients in the trial”. According to an interim data analysis, sequential decisions about whether to continue the study or not, are taken. It is considered a simple approach where selection of cut-off points is not required before the conduct of the first interim analysis. 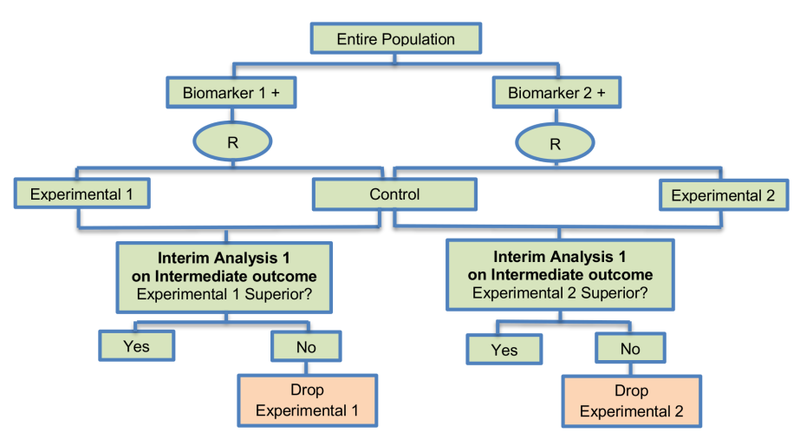 Researchers do not have to choose the cut-off points which should be used to designate the biomarker classes until the performance of the first interim analysis. Non-promising treatments can be dropped at an early stage.